It mimics the older streamtuner 0.99.99 application in look and feel. But it's an independent rewrite and runs on Python; is therefore easier to extend. Meanwhile it works mostly stable and most functions are implemented. It isn't optimized for speed however. Also it will always consume more memory than the original C implementation. And Pygtk makes it slightly less speedy. 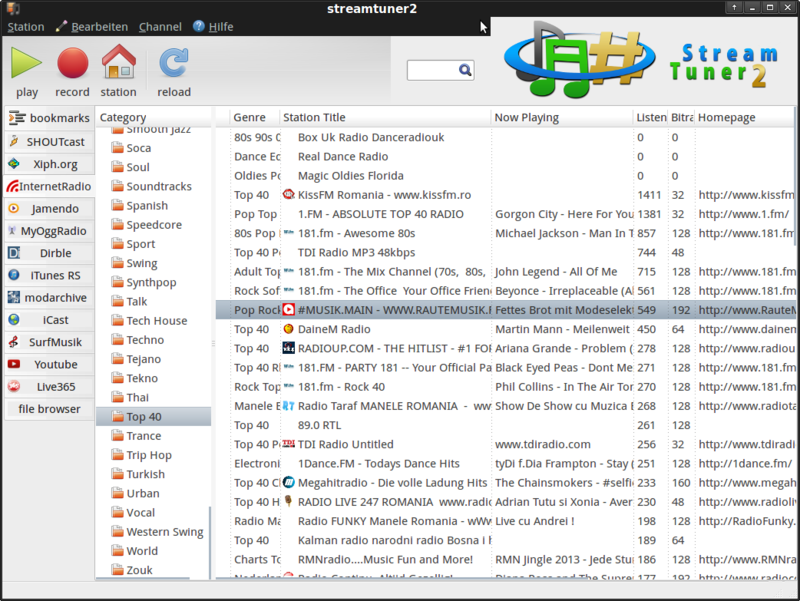 Unlike the original it loads favicons for music stations, and gives a friendlier overview. The station lists and table columns are less configurable currently. It's supposed to support a wider array of audio formats and players. For station recording it still chains to streamripper. While some lists (DMOZ) only have homepage links at the moment, others (like modarchive) provide direct download links. The long awaited console-only mode is there, which allows to start playing individual radios without invoking the GUI, and also supports exporting the station lists as JSON. An experimental yp.shoutcast wrapper module for streamtuner1 is also there. You can just download the installer, extract and run the application as-is on most BSD/Linux systems. On Windows it requires manual installation of Python+Gtk (use this 33MB pkg: sf.net/win32pyngtk.exe...) first, and is not guaranteed to run. The application is released into the Public Domain. It's open source, no strings attached. There are a few plugins which aren't distributed with the default package. ST2 has also led to some by-products, like glc2 and epm-win32sfx.